is a quiet move. Black's most common answers are: , Black at a, and tenuki. 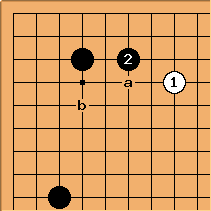 After or a, White will often play tenuki. If White plays here next, White b is a common follow-up.